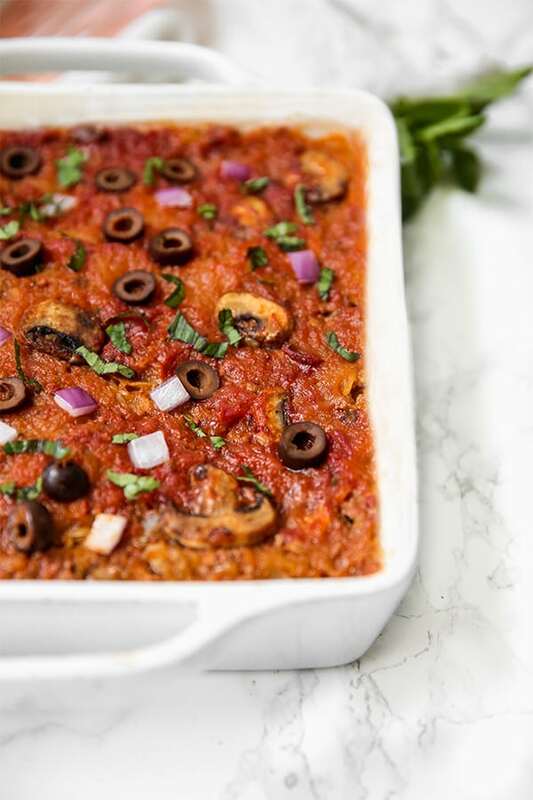 This low carb spaghetti squash pizza casserole has all of the flavors of pizza but without the grains or cheese! It’s paleo, whole30, keto, and can be easily made to be AIP complaint. If I had to name my all-time favorite food, it would have to be pizza. There simply just can’t be another. Who doesn’t love pizza? Well, I did love it… not it’s much harder to love pizza when you’re not eating grains, dairy, or nightshades. Actually, how the heck do you even do that? 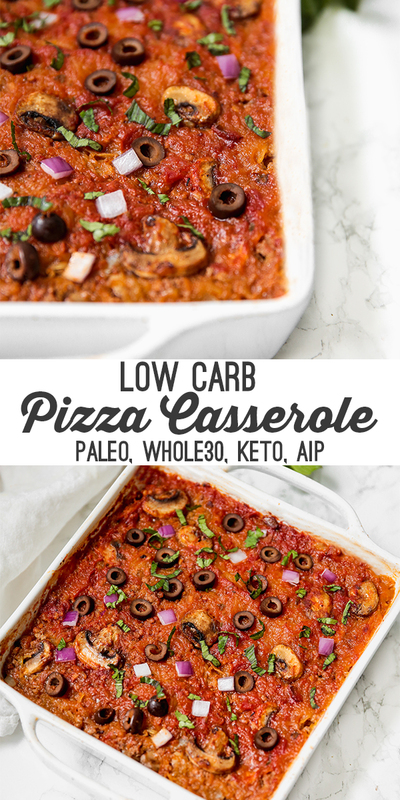 This low carb pizza casserole may help! 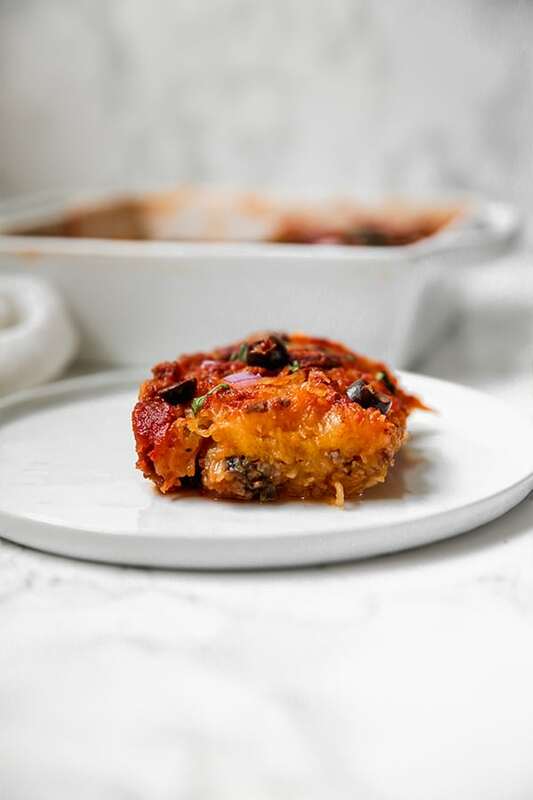 This spaghetti squash low carb pizza casserole is basically pizza if you hold the grains, dairy, and nightshades. What are you left with? Tons of veggies, and flavor! Yes, it can be done! 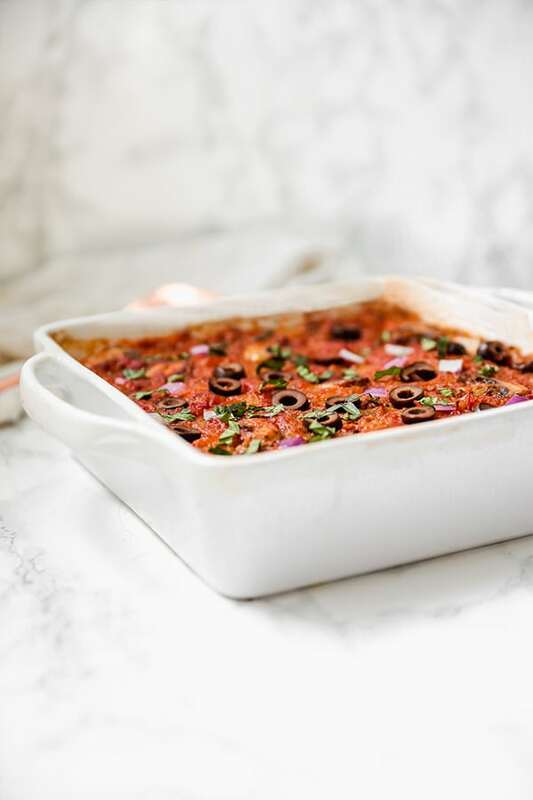 This casserole has a spaghetti squash base and is made with ground beef, mushrooms, red onion, basil, and delicious tomato free sauce, or just regular ol’ sauce if you tolerate it. Spaghetti squash, onion, mushroom, herbs, and all of the veggies in the sauce? Heck yes! This is not your everyday pizza. By nature of being a casserole, this is close to being a one-pot meal. Yes, there’s prep of making the spaghetti squash and the ground meat separately, but it’s a lot less work than making a grain-free crust and dairy free cheese. The flavors remind you of pizza! No, spaghetti squash isn’t actually pizza. I know, I know! But these flavors and ingredients really do remind you of it. You’ll use a whole spaghetti squash for this recipe. 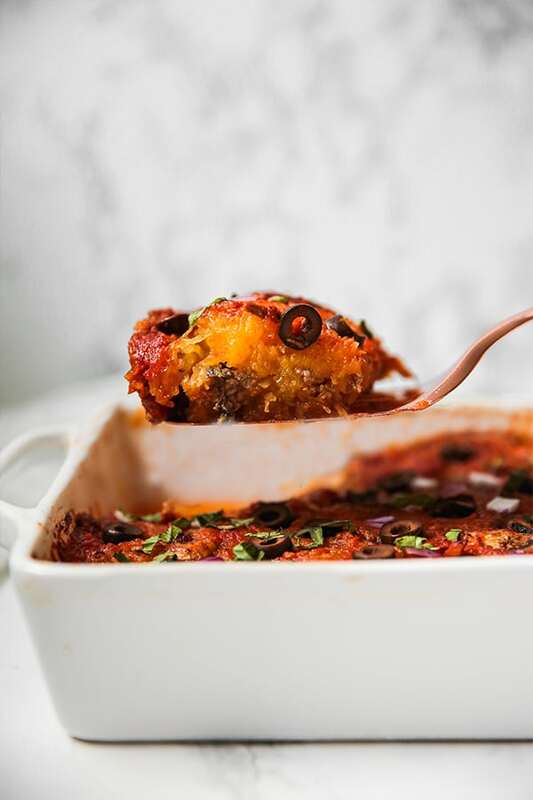 Grab a big one, because you’ll want a lot of this casserole! Since I’m nightshade free, I just used ground beef for this recipe. However, you can also use a compliant Italian sausage if you tolerate it. These are the pizza toppings I used for this recipe. If you have other toppings you like, feel free to layer them on! If you’re AIP and nightshade free you can try my tomato free sauce! If you’re on whole30 or keto and can tolerate tomatoes, just use a tomato free sauce. Using a large skillet on medium heat, brown the ground beef (or sausage) and lightly salt. Set aside, reserving some of the fat in the pan. Saute the white onion and garlic in the pan until lightly translucent. Add in the mushrooms and cook for 3-4 minutes or until soft. Set aside. Take the cooked spaghetti squash and remove the strands with a fork and place in a large mixing bowl. Use a paper towel or clean cloth to pat down some (but not all) of the excess liquid. If using eggs, whisk the eggs together in a separate bowl, and mix with the squash, salt, and pepper. Mix the ground beef, cooked vegetables (reserving about 8-10 mushroom slices), and 3/4 cup of the sauce with the spaghetti squash. Pour into the casserole dish and evenly distribute. Top the casserole with the remainder of the sauce and mushrooms. Remove from the oven and top with extra toppings. Use a spatula to remove slices and enjoy! What would be a good substitute for the mushrooms in the meat mixture? (I would be omitting eggs if that makes a difference). You can just leave it out! The recipe would still work. Enjoy! Hello! This looks yummy! Curious though-do us ok the sausage before putting it into the casserole dish (prior to baking) it does it just get cooked in the oven? Excited to try! This was a great, easy and quick meal to put together! With leftovers for the next day’s dinner, it made my life easy. I used spicy ground Italian sausage from whole foods, it was perfect for the dish.